AX 2012 R2 Project setup can be hard and confusing. If you are trying to set up anything other than a basic project you can get lost pretty fast. In this blog post I have compiled a list of possible advanced project types in AX 2012 R2 and the required correct ledger posting setup for each one. In the next blog posts we’ll talk about other required setups. We will explore advanced project types for time and material, fixed price, internal and investment projects. 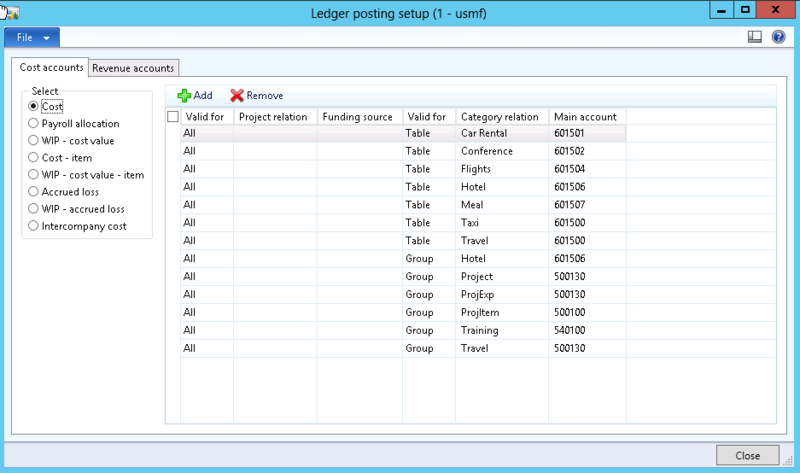 The same set up can be found in Category groups, Project categories and Project groups which will override the default ledger posting setup. Payroll allocation,P&L or Balance,Credit hour costs. WIP cost,Balance,Debit costs. Credit when invoice updating. Cost item, Profit&Loss,Credit item costs. Debit when invoice updating. WIP cost items,Balance,Debit item costs. Credit when invoice updating. Customer summary account,Balance,Debit on-accounts. Upon invoice updating debit the invoice amount. Invoiced revenue,Profit&Loss,Upon invoice updating credit the sales value of all costs. WIP Invoiced – On account,Balance,Credit on-accounts. Upon invoice updating debit on-account. Invoiced revenue,Profit&Loss,Upon invoicing credit the sales value of all costs. WIP – Sales value,Balance,Debit fees and the sales value of costs. Credit when invoice updating. Accrued revenue – Sales value,Profit&Loss,Credit fees and the sales value of costs. Debit when invoice updating. WIP Invoiced – On-account,Balance,Credit on-accounts. Debit on-accounts when offsetting on the invoice update. Customer summary account,Balance,Debit on-accounts. Upon invoice updating – debit the invoice value (sales value of all costs and fees minus on-account transactions). Completed contract method – Revenue and costs are not recognized until the contract is completed. Completed percentage method – Adds revenue and costs to profit and loss accounts as the work progresses. The revenue recognized is determined by the stage of completion of the contract every time that estimates post. Sales value principle: Costs and revenue are matched at the end of the project with a sales value. Production and profit principle: Costs and revenue are matched with a sales value that is split into realized costs and a calculated profit. 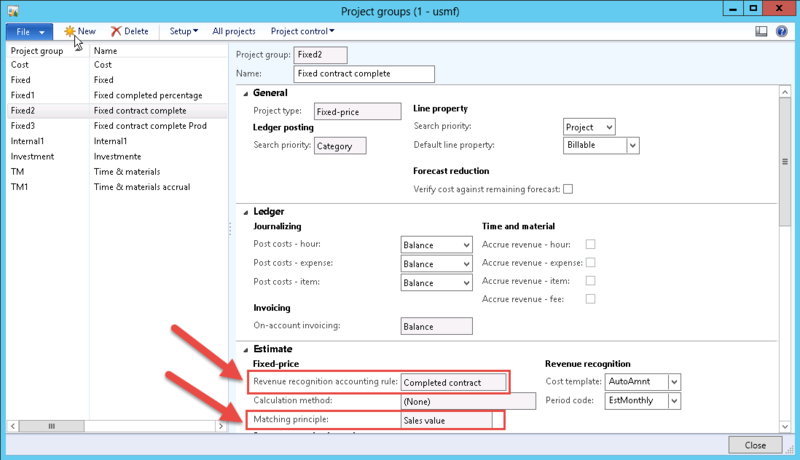 Set up the following ledger cost accounts for a fixed-price project by using the completed contract method. Cost,Profit&Loss,Debit all hours expenses and items. Payroll allocation,Profit&Loss or Balance,Credit hour costs. WIP – Cost value,Balance,Debit hour and expenses. Cost – Item,Profit&Loss,Credit item costs. WIP – Cost value – Item,Balance,Debit item costs. Customer summary account,Balance,Debit on-account invoices. Invoiced on-accounts,Profit&Loss or Balance, Credit on-account invoices. Debit when eliminating. Accrued revenue sales value,Profit&Loss,Debit on-accounts. Credit when eliminating. WIP invoiced – On-account,Balance,Credit on-account invoices. Debit when eliminating. WIP sales value,Balance,Debit on-account invoices.Credit when elimination. Invoiced on-account,Profit&Loss or Balance,Credit on-account invoices. Debit when eliminating. WIP invoiced – On-account,Balance,Credit on-account invoices. Debit calculated sales value when reaching completion percentage of 100. Accrued revenue sales value,Profit&Loss,Credit the calculated sales values that are based on the completion percentage. Debit the calculated sales value when reaching the completion percentage of 100 (only when the onaccount posted to profit and loss). WIP sales value,Balance,Debit the calculated sales values that are based on the completion percentage. Credit the calculated sales value when reaching the completion percentage of 100 and the on-account invoices are posted to profit and loss. Credit during elimination when the on-account invoices are posted to the balance account. Set up the following ledger cost accounts for a internal projects with WIP. WIP cost,Balance,Debit costs. Credit when moving costs to profit and loss. Cost item,Profit&Loss,Credit item costs. Debit when moving costs to profit and loss. WIP cost item,Balance,Debit item costs. Credit when moving costs to profit and loss. Set up the following ledger cost accounts for a investment project. WIP cost items,Balance,Debit item costs. Accrued loss,Profit&Loss,Debit costs when eliminating. This was just one small part of the entire setup, we’ll explore the rest in later posts. This entry was posted in Project on 22/05/2014 by jgracak.